I have been to five weddings since I graduated. For those of you who don’t know this, it’s time I confess: I have caught just about every single bouquet that has been tossed in my direction. That’s right. And no, I am not currently married, which means you can probably throw out that whole next-to-get-married thing (the first catch was five years ago… Yeah, I’m going to go out on a limb and suggest that a few people have probably beat me to it). Additionally, would you believe me if I genuinely said I didn’t try to catch any of them?! Yeah, I didn’t think so. But it’s the truth! Only once did I have to rip it out of another girl’s hands, but that was just because we caught it at the same time and I had the feeling I had a little more fight in me. I did. Not sure where it came from though. Maybe it was the fact that I had just gotten my heart broken by my first love for the second time (and had invited him to the wedding, which needless to say he did not attend), and I needed to prove to myself that I would find love again, somewhere, even if it wasn’t with him, and I was perfectly willing to destroy a beautiful wedding bouquet in order to prove this to myself. 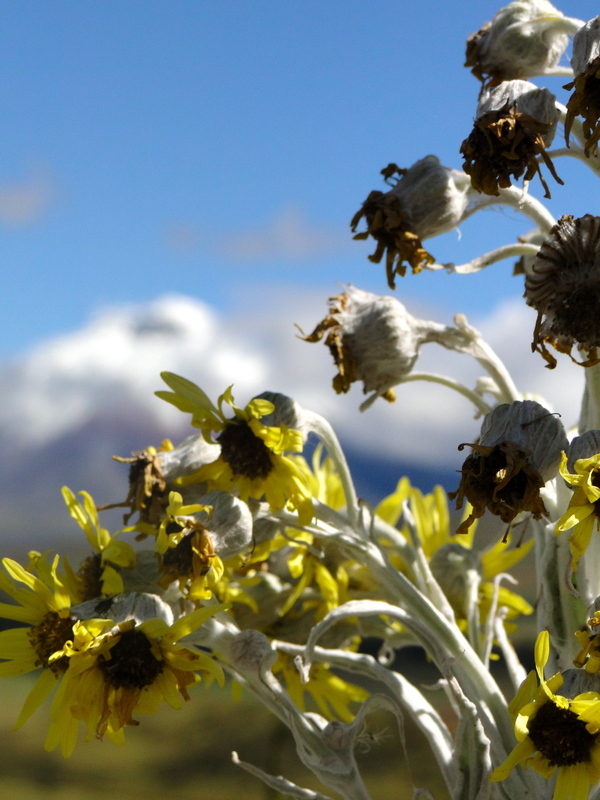 Flowers with Cotopaxi Volcano in the background. Altitude: about 15,000 ft. Cotopaxi Province, Ecuador. The first catch was the most incredible. It happened at my first wedding since college, and I was semi-secretly dating my ex-boyfriend’s best friend (oops) — but it wasn’t like that! There was something between us, and there had always been some sort of tension/interest/flirtation there (err, if you know-who-you-are is reading, hello! I should start getting used to this awkwardness, huh?). This stuff builds when you spend every year of college on a coed team wearing nothing but spandex and talking constantly of holding onto oar shafts, catching crabs (a rowing term, I assure you), and adjusting nuts (and bolts). I could go on, but just trust me on this one. I was having an absolutely fantastic summer, and was happy and excited to be at the wedding of my crew coaches — two ex-Bowdoin rowers who met at Bowdoin, on the crew team, then coached the Bowdoin crew team together, and were my first real glimpse at what I ALMOST had, I suppose. The wedding took place at the bride’s family’s farmhouse in somewhere-way-more-than-20-minutes-outside-of-Boston, MA. I was off to the side, having an intense, giggly heart-to-heart with a coxswain friend, Becky, when we heard the call for all the single ladies to get on the dance floor. Becky and I grimaced. We quickly decided that we were not going to participate… For one thing, I didn’t really feel like I was totally single, and I did not want to be a spectacle of any sort. Generally speaking, I find the whole bouquet-catching thing a little odd and uncomfortable, sort of like watching a rehearsed “first-dance” by the bride and groom (sorry to all the brides and grooms I’ve watched do this– I just don’t get that whole thing! It isn’t for me but you’re the ones getting married so you can put me in my place do your thing). 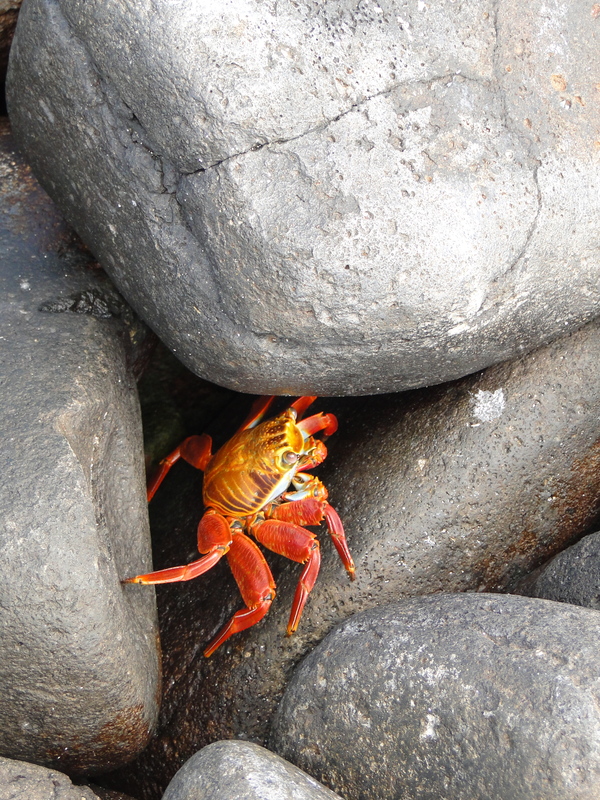 A crab in hiding. Galapagos Islands, Ecuador. We decided the smart thing to do was to slyly back ourselves away from the tented area and into a nook where we could continue our conversation in private. That’s when I heard some guy friends yell “TAVELLLL!! Get over there! !” This reminded me of when my entire grade decided to play Spin the Bottle during a ninth grade class trip, and my friend Jessica and I decided to hide in the bathroom instead because we were…petrified. We spent about an hour sweating bullets on the floor of the bathroom, thinking that – at any moment – someone might notice we weren’t out there and organize a witch hunt to find us. We giggled in a cold sweat on the floor of that tiny bathroom until all signs pointed to the game being over. I’m still not sure what I was so afraid of, but hey – I was young. Of course, it wasn’t exactly like that at the wedding (I’ve kissed a few boys since then), but I felt silly standing out there trying to catch a bouquet, pretending I wanted something which, at the time, I didn’t think I was allowed to want. We kept telling people who tried to urge us onto the dance floor that, “Nah, we’re going to sit this one out…” But then the guy with the microphone took notice and said “Is there someone named Tavel over there, come on out!” So Becky and I held hands and decided we’d just go over and participate so that everyone would leave us alone. A cluster of girls had formed so we tucked ourselves way in the back of the crowd and kept talking while the whole shebang went on. There was a drumroll, a little commotion, and then it happened: the girl directly in front of me jumped up to catch the bouquet, which was flung powerfully in our direction, and it hit the tip of her finger, then tumbled straight down, DIRECTLY into my hands. Now, I couldn’t see ANYTHING. I wasn’t reaching for the flowers, I wasn’t even in a catching position… I was literally in the back of the pack with my hands out because I was talking to Becky when it landed smack in my arms. The girls backed away to see who had caught it and Becky and I just stood there, stunned. At first, I didn’t know what to do. Then I started getting congratulations from people, and kisses and hugs from the bride and groom, not to mention several of my guy friends. Hey, I like winning. Did I just win? I sure felt like I had. That was the first catch. The most recent catch was at a wedding in CT. I have photographic evidence of this too (see below). Basically, I hesitantly placed myself in the shrinking cluster of “single/unmarried ladies” (I was dating someone great, but I think this still included me) and waited. For whatever reason, I knew it was coming right for me before it was even tossed. I also knew I was going to catch it. So, I waited, and there it was. I didn’t even have to budge. Yay. I think. Now what? 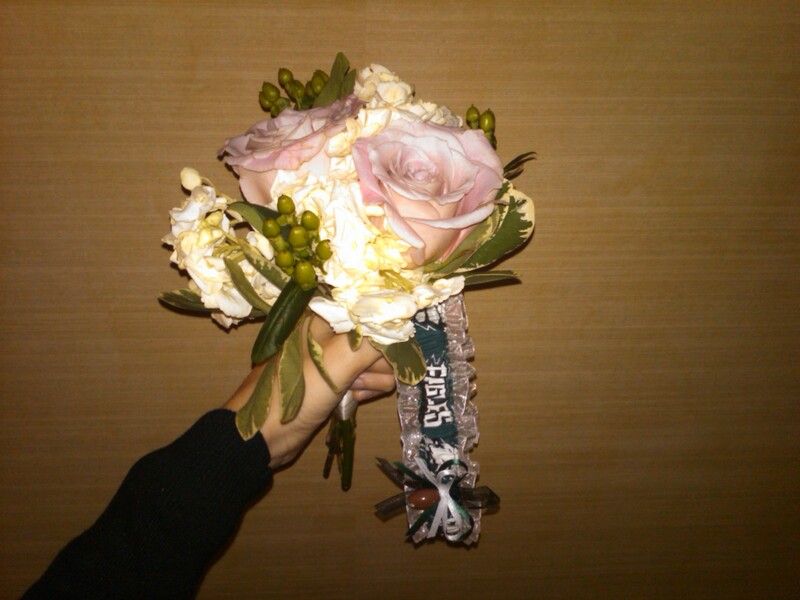 Bouquet, complete with Eagles garter which was slid onto my thigh in front of everyone. When I was a younger twenty-something, I guess catching the bouquet was like reading a horoscope: you are secretly ashamed that you’re doing it but sometimes we need a little clue from the universe about whether or not someone or something wonderful is right around the corner. If I’ve learned anything, it’s that catching a bouquet at a wedding can be an empty promise, just like reading a horoscope, and forming New Year’s resolutions only once a year. The great thing is that life throws bouquets at us all the time. You can stand there with your arms in ready position, wearing a pretty dress, waiting to catch one or snag it out of someone else’s hands, or you can stand in the back of the pack, with all your attention on something else, because — at least in my experience — that’s when it lands right in your arms. And now, I must begin studying for my Statistics exam.